Follow these before, during, and after instructions to keep your family safe in the event of a Hurricane. Have an adequate supply of propane in your tank. During and after a hurricane, propane and other types of fuel may not be readily available and roads leading to your home or farm might not be accessible for delivery. In flood zone areas, the National Fire Protection Agency (NFPA) requires that large above-ground and underground propane tanks be anchored securely to avoid potentially dangerous situations. Contact your propane retailer for more information. smell like rotten eggs, a skunk’s spray, or a dead animal. Have a list of instructions on how to turn off electricity, propane, and water. Review suggested preparations for natural disasters such as hurricanes with your propane retailer as well as other utility suppliers. Advise them of any special needs you may have. If a hurricane threatens your safety, you may have to decide whether or not it is necessary to evacuate your home or farm. Listen to your local authorities, or television and radio stations, for instructions on the appropriate course of action to take. Whether it is determined that you should stay or leave, you should shut off your gas. 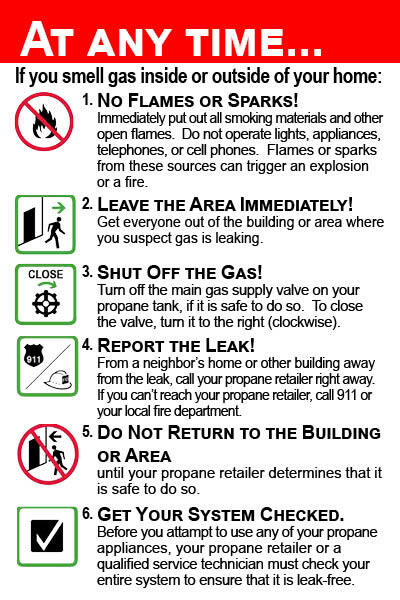 If you find a propane tank on your property that is not yours, or if your propane tank has become dislodged or is missing, contact your propane retailer or your local fire department immediately.